"Many people think of our times as being the last before the end of the world. The evidence of horror all around us makes this seem possible. But isn't that an idea of only minor importance? Doesn't every human being, no matter which era he lives in, always have to reckon with being accountable to God at any moment? Can I know whether I'll be alive tomorrow morning? "Love does not make you weak, because it is the source of all strength, but it makes you see the nothingness of the illusory strength on which you depended before you knew it." As you know, I have been commemorating the anniversary of Die Weiße Rose, the Munich Students Movement, and the series of leaflets which they produced and distributed in Nazi Germany as a statement of conscience during the height of the reign of terror. I do not think it is possible for any one of us to genuinely appreciate the courage it takes to do something like this. And I hope that we never do come to understand such an extraordinary vocation to the same degree. But each one of us is called to act, in our own way, and in our own time. “The real damage is done by those millions who want to 'get by.' The ordinary men who just want to be left in peace. Those who don’t want their lives disturbed by anything bigger than themselves. Those with no sides and no causes. Those who won’t take measure of their own strength, for fear of antagonizing their own weakness. Those who don’t like to make waves—or enemies. Those for whom freedom, honour, truth, and principles are only literature. Those who live small, love small, die small. It’s the reductionist approach to life: if you keep it small, you’ll keep it under control. If you don’t make any noise, the bogeyman won’t find you. But all too often we bargain away our souls, rebelling from even these slight and reasonable requests-- and for so little. It is impossible to engage in intellectual discourse with National Socialist philosophy, for if there were such an entity, one would have to try by means of analysis and discussion either to prove its validity or to combat it. In actuality, however, we face a totally different situation. If at the start this cancerous growth in the nation was not particularly noticeable, it was only because there were still enough forces at work that operated for the good, so that it was kept under control. As it grew larger, however, and finally in an ultimate spurt of growth attained ruling power, the tumor broke open, as it were, and infected the whole body. The greater part of its former opponents went into hiding. The German intellectuals fled to their cellars, there, like plants struggling in the dark, away from light and sun, gradually to choke to death. Now the end is at hand. Now it is our task to find one another again, to spread information from person to person, to keep a steady purpose, and to allow ourselves no rest until the last man is persuaded of the urgent need of his struggle against this system. When thus a wave of unrest goes through the land, when "it is in the air," when many join the cause, then in a great final effort this system can be shaken off. After all, an end in terror is preferable to terror without end. We do not want to discuss here the question of the Jews, nor do we want in this leaflet to compose a defense or apology. No, only by way of example do we want to cite the fact that since the conquest of Poland three hundred thousand Jews have been murdered in this country in the most bestial way. Here we see the most frightful crime against human dignity, a crime that is unparalleled in the whole of history. For Jews, too, are human beings - no matter what position we take with respect to the Jewish question - and a crime of this dimension has been perpetrated against human beings. All male offspring of the houses of the nobility between the ages of fifteen and twenty were transported to concentration camps in Germany and sentenced to forced labor, and all the girls of this age group were sent to Norway, into the bordellos of the SS! Why tell you these things, since you are fully aware of them - or if not of these, then of other equally grave crimes committed by this frightful sub- humanity? Because here we touch on a problem which involves us deeply and forces us all to take thought. Why do German people behave so apathetically in the face of all these abominable crimes, crimes so unworthy of the human race? Hardly anyone thinks about that. It is accepted as fact and put out of mind. The German people slumber on in their dull, stupid sleep and encourage these fascist criminals; they give them the opportunity to carry on their depredations; and of course they do so. Is this a sign that the Germans are brutalized in their simplest human feelings, that no chord within them cries out at the sight of such deeds, that they have sunk into a fatal consciencelessness from which they will never, never awake? It seems to be so, and will certainly be so, if the German does not at last start up out of his stupor, if he does not protest wherever and whenever he can against this clique of criminals, if he shows no sympathy for these hundreds of thousands of victims. He must evidence not only sympathy; no, much more: a sense of complicity in guilt. Thankfully few are called to the martyr's crown. But we are all called to take up our cross and follow, each day, in each of our own small ways. That is all most of us can do-- be still, and faithful, and wait on the Lord in our calling. And above all do not add to or assist, in any way, the evil in the world, especially by condemning or harming those who stand up against its onslaught. That is Pilate's sin, to ask 'What is truth' and turn away and lie, if only to ourselves, while looking truth in the face, for the sake of expediency. It is a sin against the Spirit, and one that will not be easily forgiven. We may believe what we will. But we will be held accountable for our beliefs. "I was satisfied that I wasn't personally to blame and that I hadn't known about those things. I wasn't aware of the extent of the crimes. 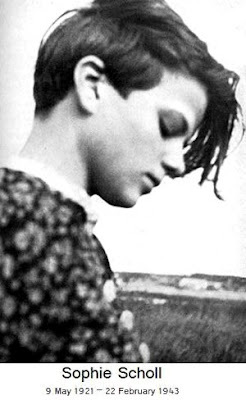 But one day I went past the memorial plaque which had been put up for Sophie Scholl in Franz Josef Strasse, and I saw that she was born the same year as me, and she was executed the same year I started working for Hitler. And at that moment I actually sensed that it was no excuse to be young, and that it would have been possible to find things out." On 22 February 1943, Scholl, her brother Hans and their friend Christoph Probst were found guilty of treason and condemned to death. They were all beheaded by executioner Johann Reichhart in Munich's Stadelheim Prison only a few hours later, at 17:00 hrs. The execution was supervised by Walter Roemer, the enforcement chief of the Munich district court. "How can we expect righteousness to prevail when there is hardly anyone willing to offer themselves up individually for a righteous cause? Such a fine, sunny day, and I have to go." "...It is the time of the harvest, and the reaper cuts into the ripe grain with wide strokes. Mourning takes up her abode in the country cottages, and there is no one to dry the tears of the mothers. Yet Hitler feeds those people whose most precious belongings he has stolen and whom he has driven to a meaningless death with lies. Every word that comes from Hitler's mouth is a lie. When he says peace, he means war, and when he blasphemously uses the name of the Almighty, he means the power of evil, the fallen angel, Satan. His mouth is the foul maw of Hell, and his power is at bottom accursed. True, we must conduct a struggle against the Nazi terrorist state with rational means; but whoever today still doubts the reality, the existence of demonic powers, has failed by a wide margin to understand the metaphysical background of this war. Behind the concrete, the visible events, behind all objective, logical considerations, we find the irrational element: The struggle against the demon, against the servants of the Antichrist. Everywhere and always demonic powers lurk in the dark, waiting for the moment when man is weak; when of his own volition he leaves his place in Creation, as founded for him by God in freedom; when he yields to the force of evil, he separates himself from the powers of a higher order; and after voluntarily taking the first step, he is driven on to the next and the next at a furiously accelerating rate. Everywhere, and at times of greatest trials, men have appeared, prophets and saints who cherished their freedom, who preached the One God and who with His help brought the people to a reversal of their downward course. Man is free, to be sure, but without the true God he is defenseless against the principle of evil. He is a like rudderless ship, at the mercy of the storm, an infant without his mother, a cloud dissolving into thin air..."
Please distribute this as widely as possible. "Isn't it a riddle and awe-inspiring that things can be so beautiful, despite the horror? I've seen something wondrous peering through my joy in the beautiful, a sense of its creator...Only people can be truly ugly, because they have free will to separate themselves from this song of praise.